Larry Ruttman has a mission. 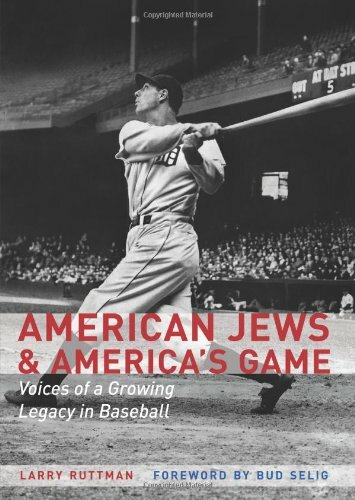 With his book on American Jews and baseball, he wants to prove that successful Jewish Americans connected to baseball owe their success to Jewish values. Many of the prominent Jewish Americans he has interviewed agree with his idea that their work ethic, desire to succeed and become wealthy, their determination to be just, fair, and charitable, may stem directly from the Jewish values they were taught by their parents and grandparents. As for those he interviewed who doubt this connection, or who state clearly that there is no connection ( "I did it all myself"), Mr. Ruttman often contradicts them, asserting for his readers that their successful lives align clearly with Jewish values and that their accomplishments prove a basis in traits taught by Judaism. Among the well-known Americans with some connection to baseball that Mr. Ruttman interviews for this book are players, owners, managers, coaches, rabbis, history professors, entrepreneurs, and one "redeemed" convicted criminal, a former umpire who has served jail time for his errors. The lengthy interviews Mr. Ruttman conducted are published almost verbatim, making the book long, wordy, and repetitive. One of the points that often surfaces in these interviews is that baseball served as an Americanizing factor for immigrants of the early 1900s and their families. Historians have known this for fifty years, so the idea could have been presented much more succinctly by the use of paraphrasing. Mr. Ruttman queries his subjects about the practice of Judaism in their home life both when they were children and also in their current adult lives, since he wants to establish a connection between these practices and success. He often asks directly whether these practices are related to the person's accomplishments in life. His query would have had more value if he had instead asked what the subject believed he could credit for his success. If he had, the answer might have been something like "the values taught by my family," and eventually these values might have been identified as Jewish ones, not by the interviewer but by his subjects themselves. That would have enhanced the value of the subjects' answers for social historians interested in the results. That curmudgeonly politician, Barney Frank, responded sharply to Mr. Ruttman's tendency to try putting words into the mouths of some of his respondents. When Mr. Ruttman asked Frank who were the most influential Jewish off-field luminaries, Frank replied "Jewish figures? Baseball figures? I have no idea. I can't think of any." Mr. Ruttman countered with "Like Bud Selig? [the Commissioner of Baseball]" Barney attacked. "You asked me a question, and I have given you the answer. If you don't like my answer, don't suggest an answer--that's not good journalism!" Mr. Ruttman is also interested in whether his interviewees think that Judaism, which is losing adherents in its more Orthodox forms, will change or even endure. Most stated that they believed Judaism will last despite this challenge, although it will continue to change as the Orthodox practices soften into Reform observances and as young Jews keep marrying outside Judaism. Discussing the prevalence of intermarriage, one interviewee revealed that his family now includes not only Catholics and Protestants but also Blacks and Asians. One of the younger persons interviewed remarked astutely that today, a person's identification as Jewish or Irish or Catholic is "no longer important" in social and business life. The author queried his subjects not only about Judaism but about baseball. He wondered whether any had suffered, while playing ball, from discrimination for their beliefs and ethnicity. Most of the older respondents told some stories about engaging in fights or enduring name-calling, even within Organized Baseball. One striking story revealed that Denny McLain, then a minor-league pitcher, had been fined and suspended for shouting anti-Semitic remarks to opposing player Al Clark after a game. The long, detailed interviews in Mr. Ruttman's book will be of interest to those curious about the lives of persons connected with baseball or in the changing practices of Judaism, but because of the author's frequent attempts to force the answers he wants from his respondents, the replies to his questions may have limited value.